Furutech U.S. FI-11M Copper male - $49.99 ea. Furutech U.S. FI-11M N1 Gold male - $69.99 ea. Furutech U.S. FI-11M N1 Rhodium male - $89.99 ea. Furutech U.S. FI-12ML GOLD angle - $89.99 ea. Furutech U.S. FI-12ML Rhodium angle - $99.99 ea. Furutech U.S. FI-25M GOLD male - $102.99 ea. Furutech U.S. FI-28M GOLD male - $112.99 ea. Furutech U.S. FI-28M RHODIUM male - $138.99 ea. Furutech U.S. FI-50M GOLD male - $279.99 ea. Furutech U.S. FI-50M RHODIUM male - $339.99 ea. Furu FI-50M NCF RHODIUM male - $384.99 ea. 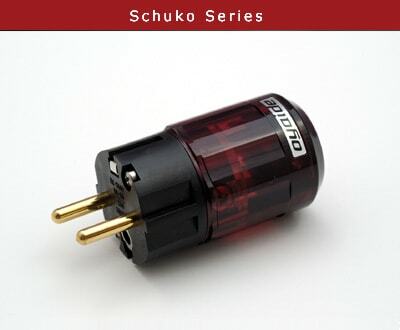 Furutech Schuko FI-E11 COPPER male - $60.99 ea. Furutech Schuko FI-E11 GOLD male - $77.99 ea. Furutech Schuko FI-E11 RHODIUM male - $117.99 ea. Furutech Schuko FI-E38 GOLD male - $149.99 ea. Furutech Schuko FI-E38 RHODIUM male - $180.99 ea. Furutech Schuko FI-E50 CF/RHODIUM male - $384.99 ea. Furutech U.K. FI-UK Gold male - $161.99 ea. Furutech U.K. FI-UK RHODIUM male - $198.99 ea. Furutech Aussie FI-AU3112 Gold male - $131.99 ea. Furutech Aussie FI-AU3112 Rhodium - $161.99 ea. Furutech Aussie FI-50 AUSSIE Rhodium - $369.99 ea. 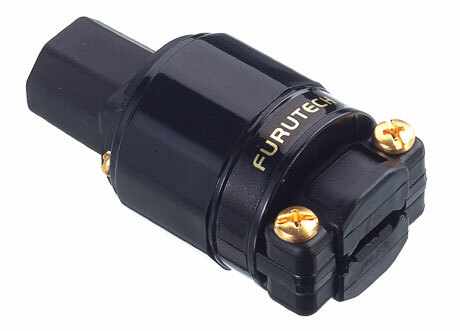 Furutech's FI-11 series male AC connectors are arguably the best bang for the buck connectors on the market, and will accept larger O.D. cabling (up to 16mm). They are very easy to work with, require no soldering, and will accept up to two 12 AWG wires per terminal. The male blades are made from pure copper and the connector includes Furutech's special "ground jumper" system that connects the housing screws to the safety ground, thus eliminating magnetic interactions. Their clamping mechanism allows superior clamping pressure on the wires, and their cable body clamp is extremely well designed. Mate these with a good AC Wall Receptacle for ultimate performance. Available in the solid (unplated) copper FI-11M (Cu), gold plated copper FI-11M (G), or rhodium plated copper FI-11M (R) versions. NEW ITEM! The Furutech FI-12ML is similar to the Furutech FI-11 series, but allows for an adjustable right-angle orientation. 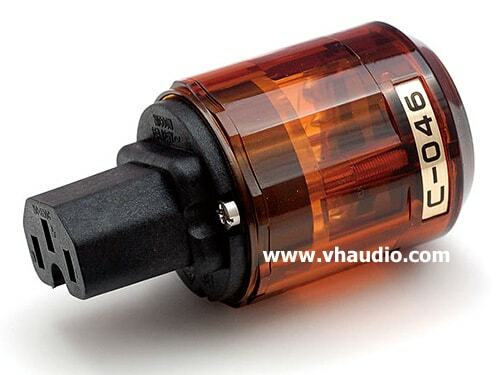 VH Audio is now the exclusive provider for the FI-12 series with GOLD plating. 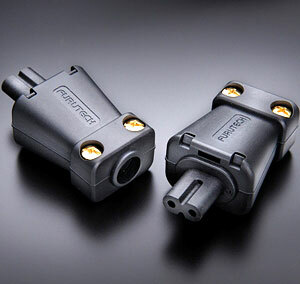 Furutech's premium FI-25 and FI-28 series male AC connectors are incredible sounding connectors, and are very easy to work with. They require no soldering, and will accept up to two 12 AWG wires per terminal. The metallic parts are made with OCC, OFC copper or highly conductive phosphor bronze, and include Furutech's special "ground jumper" that connects the screws to the safety ground, thus eliminating magnetic interactions. The FI-25 and FI-28 also grounds the strain relief clamp screws. Their clamping mechanism allows superior clamping pressure on the wires. All versions also undergo Furutech's proprietary demagnetization process and cryogenic treatment. A deep, thick silver layer is plated over the base metal before the final plating is applied to the Rhodium version. Mate these with a good AC Wall Receptacle for ultimate performance. NEW ITEM! 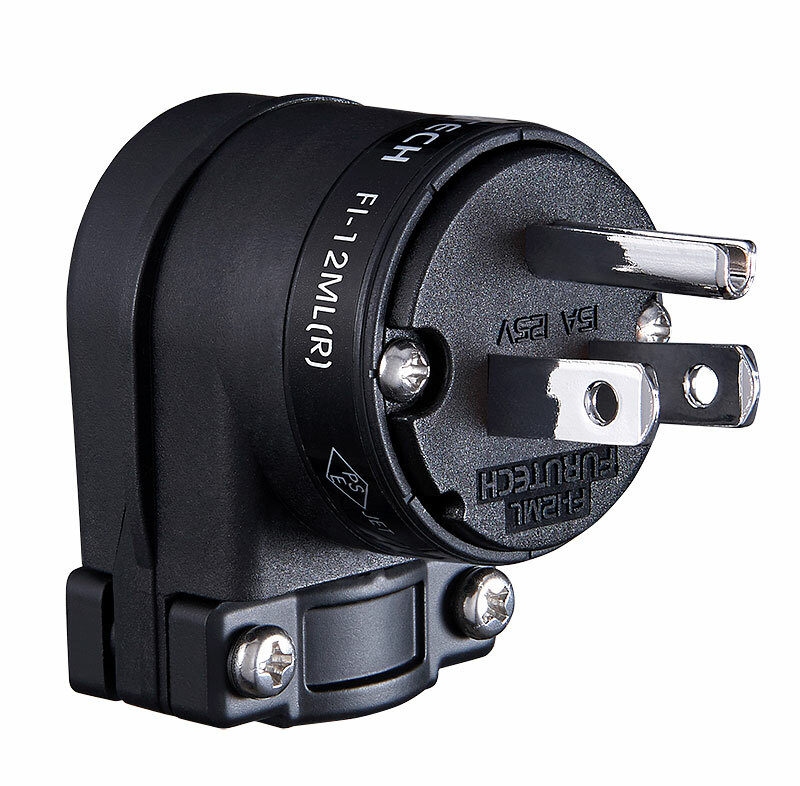 Furutech has just released the new FI-E35 Schuko connector that has the same clamping mechanism as the FI-25 series, allowing for up to TWO 12AWG conductors per terminal. 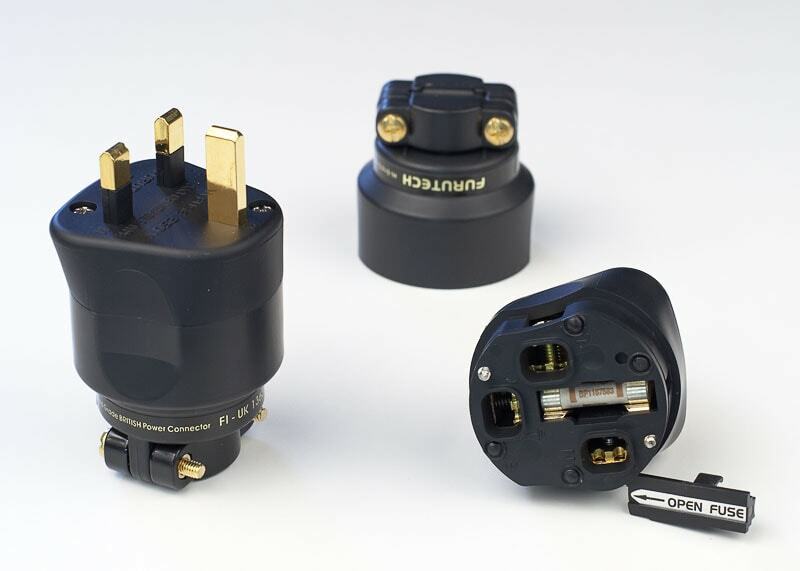 This is the first and only Schuko connector on the market that uses PURE COPPER for the conductor pins, and is sure to raise the bar yet again for Schuko connectors. Available in gold or rhodium plating. 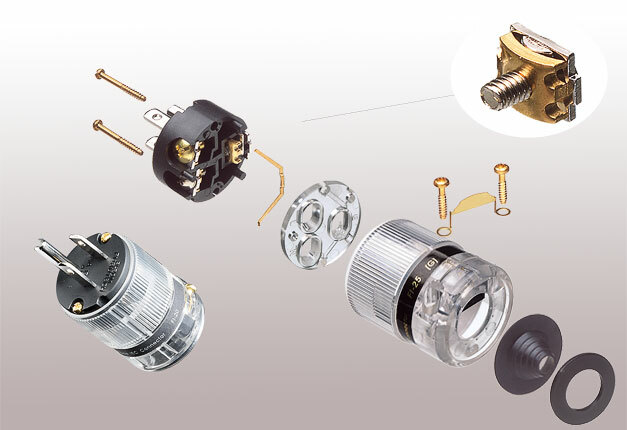 The Furutech FI-E11 series uses a similar clamping mechanism as the US FI-11 series, however, the pins are made with Eutectic brass, and the terminations are similiar to the Furutech FI-10 series IEC inlets. The Furutech FI-E38 series is similar to the FI-E35 series, has a slightly different shell, and an improved strain relief clamping mechanism. NEW ITEM! VH Audio is pleased to announce the exclusive availability of the Furutech FI-50M GOLD!. Add to cart to see the discounted price. 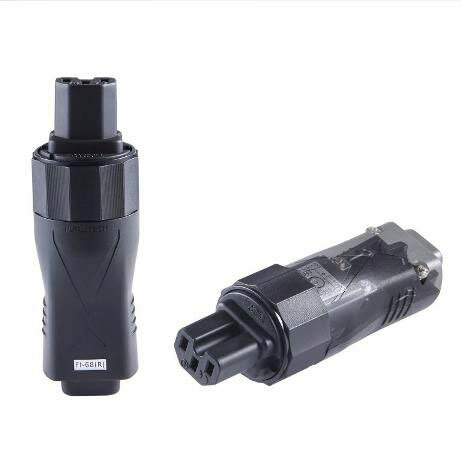 Furutech's state-of-the-art FI-50 Piezo Ceramic series of carbon fiber connectors, includes the FI-50 IEC, FI-52 20A IEC, FI-50M Male connector, and FI-E50 Schuko Male connector! There is also a new version of the Furutech FI-50, with the 'NCF' designation, that includes Furutech's new Nano Crystal Formula (NCF). The base metal is Furutech's Pure copper (not brass or bronze) Rhodium (or Gold) plated Conductor (made with their alpha process). 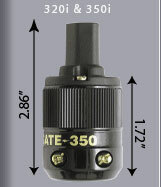 The FI-50 series uses a similar Earth Ground system, similar to their FI-25 / FI-28 series series. The nylon/fiberglass connector body incorporates nano-sized ceramic particles for absorption of vibrations and resonances. Finally a multi layered nonmagnetic stainless steel and carbon fiber housing, which also incorporates an acetal copolymer. Only the absolute best materials were used for this connector series, and it will now likely become the "cream of the crop" of audiophile power connectors. FREE Deep Cryogenic treatment on all P-0XX and M1 series! WattGate 5266i CRYO - $12.99 ea. WattGate 5266 EVO Clear - $32.99 ea. WattGate Gold 330i CLASSIC - $77.99 ea. WattGate Gold 330 EVO Clear - $96.99 ea. WattGate Silver 330iAG - $77.99 ea. WattGate Rhodium 330 EVO Clear- $116.99 ea. WattGate EVO Schuko Clear - $32.99 ea. WattGate EVO 390 Gold Schuko Clear - $96.99 ea. WattGate EVO 390 Rhodium Schuko Clear - $116.99 ea. 90 degree adapter (backshell only) - $15.99 ea. 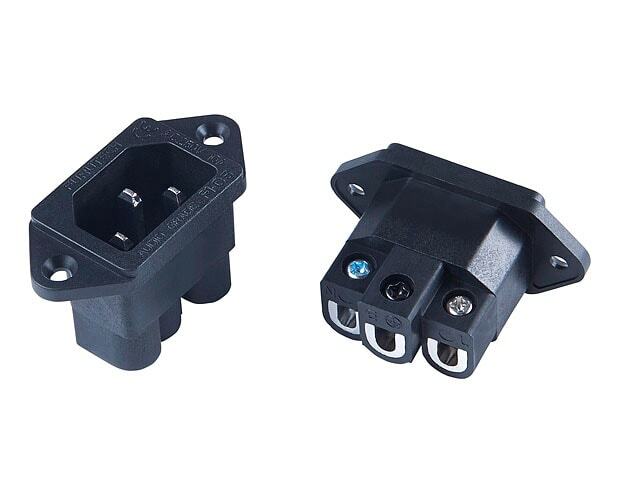 WattGate male AC connectors are the standard by which all other connectors are judged, and represent exceptional value. All the WattGate connectors have been recently updated to use non-magnetic stainless steel screws. They require no soldering, and will accept up to a single 10 AWG wire per terminal (without modification). The brass contacts are available unplated 5266i series, or plated with gold 330i series. WattGate's proprietary plating process uses a layer of OFC copper, followed by electroless nickel, and finally a layer of 24K gold. WattGate connectors are now cryogenically treated by WattGate. NEW ITEM! WattGate's new SILVER plated 330iAg connectors are now available! They utilize the same plating process as the 330i gold series, but finish with a layer of pure silver, in lieu of 24K gold. 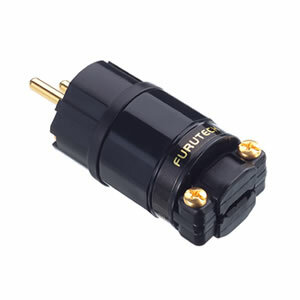 FURUTECH FI-8N Gold C7 IEC Plug - $56.99 ea. FURUTECH FI-8N Rhodium C7 IEC Plug - $70.99 ea. Furutech FI-C15 Gold Slim IEC - $57.99 ea. Furutech FI-C15 NCF Rhod Slim IEC - $84.99 ea. 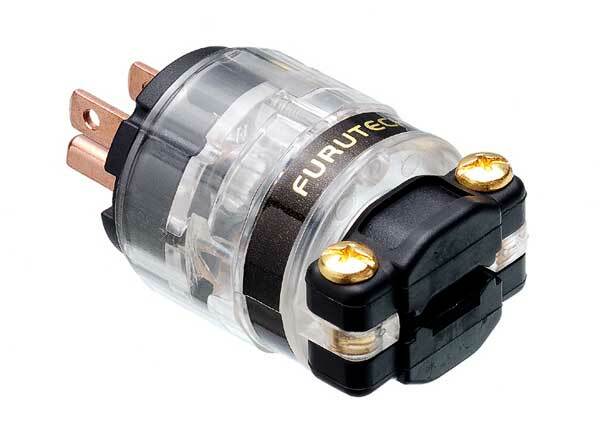 FURUTECH FI-11 Copper IEC Plug - $49.99 ea. FURUTECH FI-11 Gold (N1) IEC Plug - $69.99 ea. 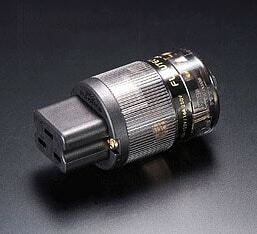 FURUTECH FI-11 Silver IEC Plug - $69.99 ea. FURUTECH FI-11 Rhodium IEC Plug - $89.99 ea. 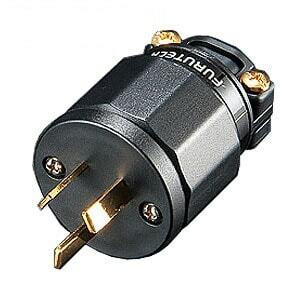 FURUTECH FI-12L GOLD Angle IEC Plug - $89.99 ea. 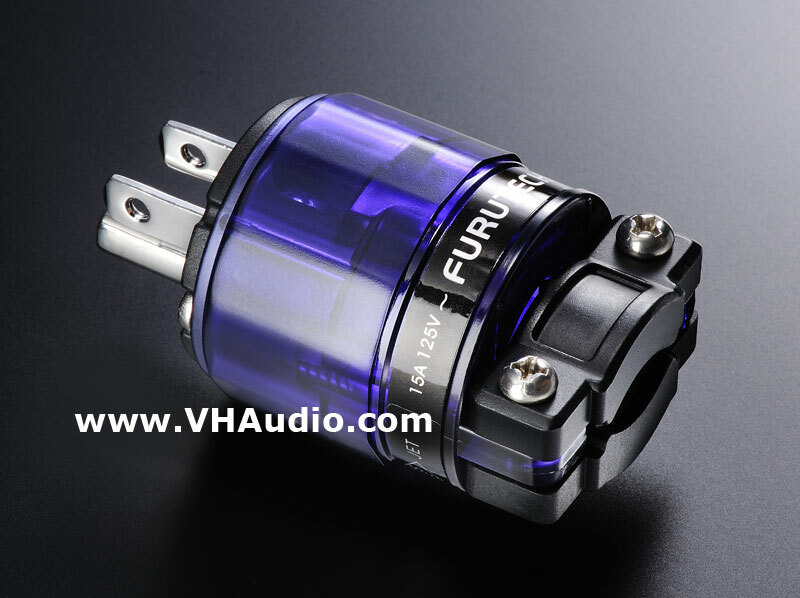 FURUTECH FI-12L Rhodium Angle IEC Plug - $99.99 ea. FURUTECH FI-28 GOLD IEC Plug - $112.99 ea. FURUTECH FI-28 Rhodium IEC Plug - $138.99 ea. FURUTECH 20A FI-31 Gold IEC Plug - $139.99 ea. FURUTECH 20A FI-32 Rhodium IEC Plug - $202.99 ea. FURUTECH FI-50 Rhodium CF IEC Plug - $339.99 ea. 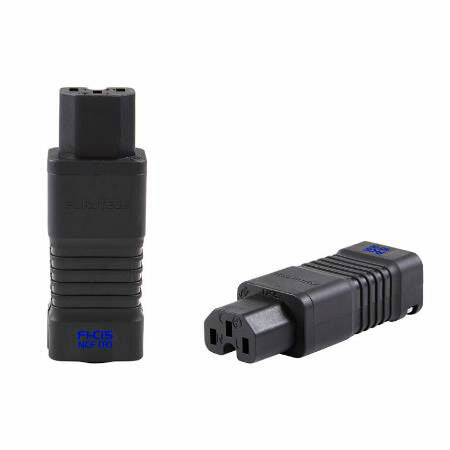 FURU FI-50 NCF Rhod CF IEC Plug - $384.99 ea. FURUTECH-FI-52 20A CF/Rhodium IEC Plug - $349.99 ea. FURUTECH-FI-52 NCF 20A CF/Rhodium IEC Plug - $405.99 ea. NEW ITEM! Furutech has made a quality C7 IEC connector for you to use on your own cables! The Furutech FI-8N IEC C7 is the first aftermarket C7 connector available for audiophiles and videophiles, and a major bump in quality vs. the molded rubber connector you'll find on stock cords. A great alternative to C7 adapters. Available in Gold or Rhodium platings. The Furutech FI-C15 slimline IEC is an outstanding connector solution if you own LINN, Devialet McIntosh amplifiers, some subwoofer manufacurers (as well as others), with IEC sockets that are in difficult spots. Some components don't have the necessary space to allow conventional aftermarket IEC's to fit. The Furutech FI-C15 high performance IEC connector's slim design will fit those space constrained IEC sockets with ease! Available in two versions: Gold plated copper, or the NCF version which uses Rhodium plating over copper, as well as Furutech's NCF (Nano Crystal Formula). 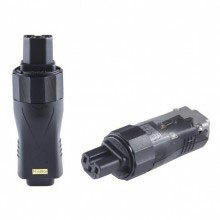 Furutech's FI-11 series connectors are arguably the best bang for the buck IEC connectors on the market, and will accept larger O.D. cabling (up to 16mm). They are very easy to work with, require no soldering, and will accept up to two 12 AWG wires per terminal. 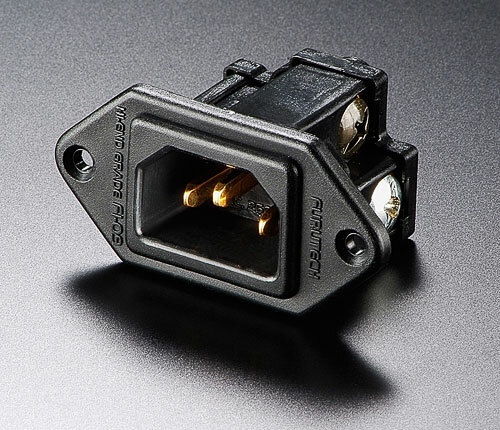 The electrical contacts' base metal is phosphor bronze, and platings available are copper, gold and silver.THis connector also includes Furutech's special "ground jumper" system that connects the screws to the safety ground, thus eliminating magnetic interactions. Their clamping mechanism allows superior clamping pressure on the wires, and their cable body clamp is extremely well designed. Mate these with Furutech's 15A IEC inlets for ultimate performance. Available in three plating schemes: FI-11Cu (copper), FI-11G (gold), and FI-11Ag (silver). NEW ITEM! The Furutech FI-12L series is similar to the Furutech FI-11 series, but allows for an adjustable right-angle orientation. Furutech's FI-25 series IEC connectors are incredible sounding connectors, and are very easy to work with. They require no soldering, and will accept up to two 12 AWG wires per terminal. The metallic parts are made with OCC, OFC copper or highly conductive phosphor bronze, and include Furutech's special "ground jumper" that connects the screws to the safety ground, thus eliminating magnetic interactions. Their clamping mechanism allows superior clamping pressure on the wires. All versions also undergo Furutech's proprietary demagnetization process and cryogenic treatment. A deep, thick silver layer is plated over the base metal before the final plating is applied. Mate these with Furutech's 15A IEC inlets for ultimate performance. 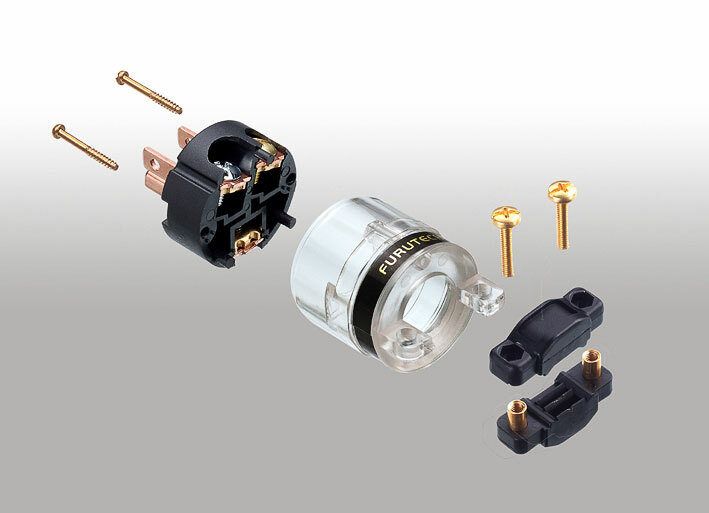 Furutech has just released the 20 amp connectors, available in Rhodium FI-32R or Gold FI-31G plated versions. Mate these with Furutech's new 20 amp IEC inlets for ultimate performance. NEW ITEM! 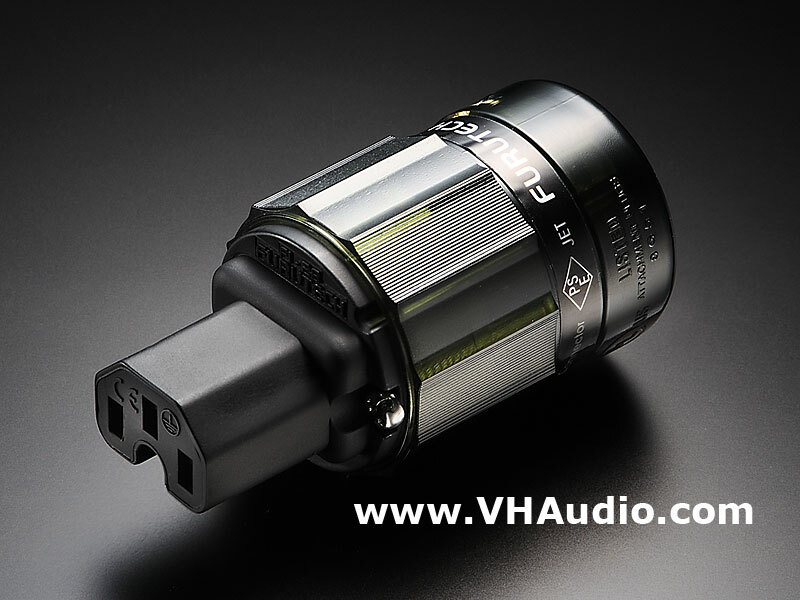 VH Audio is pleased to announce the exclusive availability of the Furutech FI-50 GOLD! 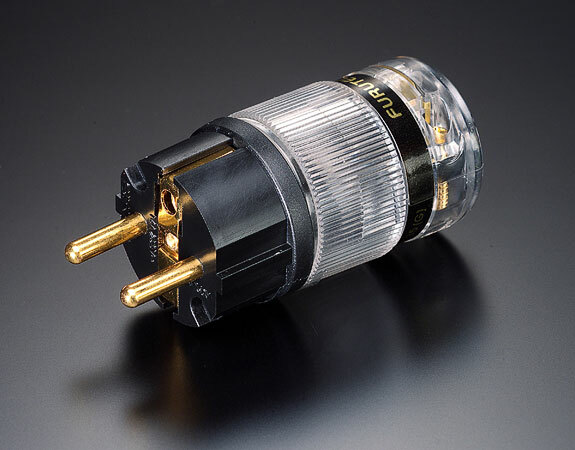 What makes the FI-50 and FI-52 IEC connectors unique is its use of Furutech's (Alpha) Pure Copper Rhodium plated conductor (or Gold plated conductor for the FI-50). The FI-50 is the only IEC connector I'm aware of that uses PURE copper (not brass, bronze, beryllium, etc...). The FI-50 also uses Furutech's Earth (Ground) Jumper System (US Patent No. : 6,669,491 ), and employs a nylon/fiberglass body incorporating nano sized ceramic particles for absorption of vibrations and resonances. 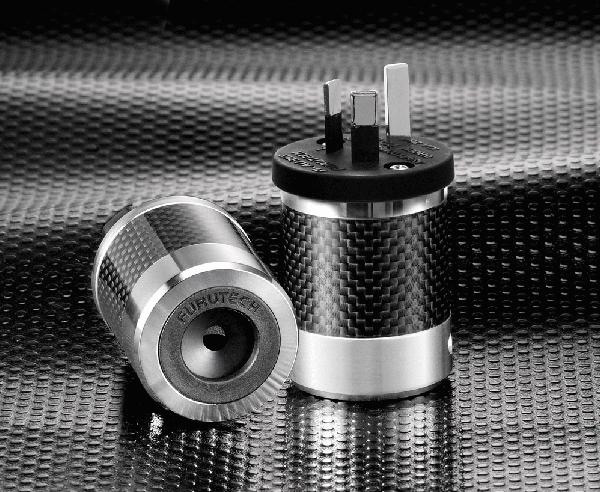 The multi layered nonmagnetic stainless steel and carbon fiber housing of the FI-50 is absolutely beautiful, and also incorporates an acetal copolymer for optimum performance. Only the best materials were used to make the FI-50. There is also a new version of the Furutech FI-50, with the 'NCF' designation, that includes Furutech's new Nano Crystal Formula (NCF). Furutech FI-68(G) Filtered IEC - $187.99 ea. Furutech FI-68(R) Filtered IEC - $216.99 ea. 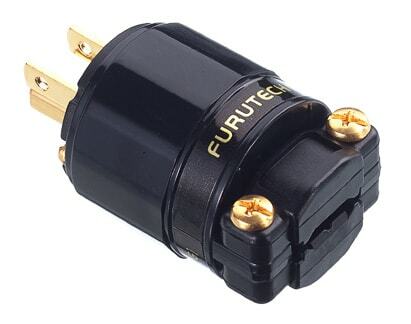 The Furutech FI-68 is a sophisticated inline power filtering device that is used to terminate onto your favorite AC power cable, and is used in place of a conventional IEC connector. The FI-68 eliminates many common issues that are caused by contaminated electrical power lines, and offers protection against distortion caused by ground noise, voltage spikes and sags, high frequency power supply noise from other components in your own system, as well as high-frequency digital noise emanating from processors and digital interconnects. NEW ITEM! Oyaide (pronounced "Oh-yah-ee-day") is the new kid on the block, with their AC power connectors and receptacles. One look at these confirms the Japanese obsession with quality materials and workmanship. This company is a contender for one of the best AC connectors on the market today, with special attention paid to the polishing and plating processes used. Will accomodate cable sizes from 6.5 mm to 17 mm and wires up to 10AWG. The new Oyaide C-004 and F1 F-1 are the cream of this crop, with beryllium copper base metal with platinum and palladium platings. FREE Deep Cryogenic treatment upgrade on all C-0XX and F1 series IEC's! WattGate 320 Classic - $19.99 ea. WattGate 320 EVO Clear - $32.99 ea. WattGate 320i HC 20 amp CRYO - $35.99 ea. WattGate 350i Gold - $77.99 each WattGate 350 EVO Gold Clear - $96.99 ea. WattGate 350iAG Silver - $77.99 ea. WattGate 350 EVO RHODIUM Clear - $116.99 ea. 20A WattGate 350i HC Gold - $97.99 ea. 20A WattGate 350iAG HC SILVER - $97.99 ea. 90 degree adapter (backshell only) - $15.99 ea. 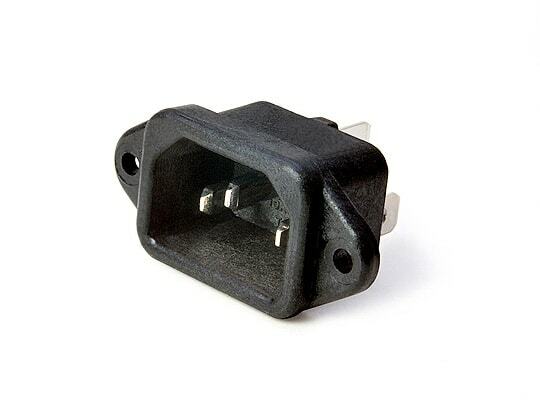 WattGate IEC connectors are the standard by which all other connectors are judged, and represent exceptional value. All the WattGate connectors have been recently updated to use non-magnetic stainless steel screws. They require no soldering, and will accept up to a single 10 AWG wire per terminal (without modification). The brass contacts are available unplated 320i series, or plated with gold 350i series. WattGate's proprietary plating process uses a layer of OFC copper, followed by electroless nickel, and finally a layer of 24K gold. WattGate connectors are now cryogenically treated by WattGate. NEW ITEM! The Wattgate 350i HC (high current) is the 20 amp verison of the 350i. WattGate's new SILVER plated 350i connectors are now available in both 15A and 20A (HC) versions! They utilize the same plating process as the 350i gold series, but finish with a layer of pure silver, in lieu of 24K gold. 15A Furutech FI-06 GOLD IEC Inlet - $27.99 ea. 15A Furutech FI-06 Rhodium IEC Inlet - $35.99 ea. 15A Furu FI-06 NCF Rhod IEC Inlet - $39.99 ea. 15A Furutech FI-09 GOLD IEC Inlet - $85.99 ea. 15A Furutech FI-09 Rhodium IEC Inlet - $108.99 ea. 15A Furutech FI-09 NCF Rhodium IEC Inlet - $109.99 ea. 15A Furutech FI-03 GOLD IEC Inlet - $21.49 ea. 15A Furutech FI-03 Rhodium IEC Inlet - $27.99 ea. 20A Furutech FI-33 GOLD IEC Inlet - $102.99 ea. 20A Furutech FI-33 Rhodium IEC Inlet - $114.99 ea. 20A Furutech FI-33 NCF IEC Inlet - $119.99 ea. NEW ITEM! 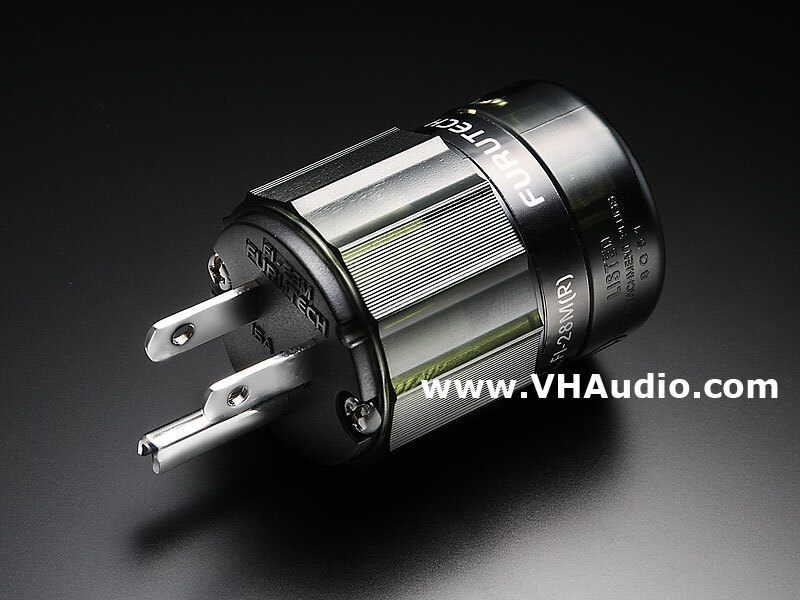 FI-06 (Gold or Rhodium) The new Furutech FI-06 IEC inlet is the successor to Furutech's excellent FI-10 series (below). The primary difference relates to the upgrade from high conductivity phosphor bronze to pure, solid copper used in the FI-06. Please note that the size of the FI-06 is larger than the FI-10, so please checkout your cutout dimensions to ensure the FI-06 will fit. 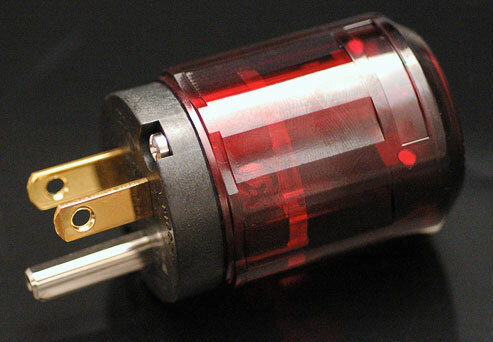 The new > Furutech FI-06 NCF < is also now available, using Furutech's new Nano Nano Crystal Forula. 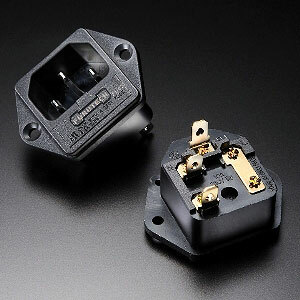 FI-09(R) & FI-09(G) - Furutech has just introduced the FI-09 15 AMP PREMIUM Gold or Rhodium plated IEC inlets! 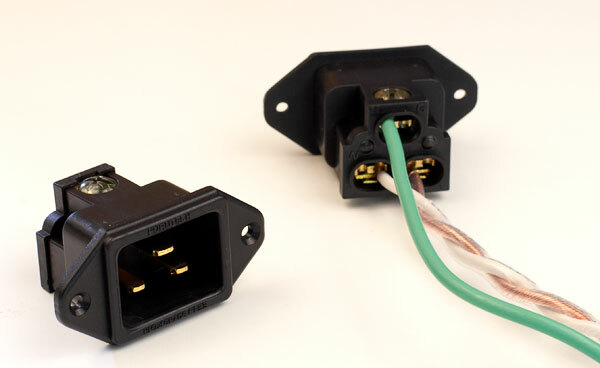 This newly designed 15A IEC inlet utilizes the same clamping technology as found in Furutechs 20 amp inlets and connectors. Will accept up to 4mm wire diameter and the clamping plates are made of pure copper, NOT brass. FI-33(R) & FI-33(G) - Furutech has recently introduced the FI-33 20 AMP Gold or Rhodium plated IEC inlets! To my knowledge, these are the very first serious attempt at an audiophile grade 20 amp IEC inlet. 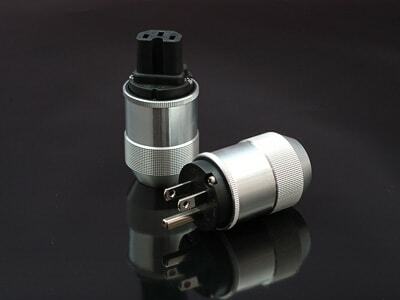 The clamping mechanism is similar to that of the FI-25 series connectors, but is futher refined with a patent pending pressure plate that increases the surface area and grip of the clamps. You can easily get two 12 AWG conductors into each termination point (H, N, G). NEW ITEM! 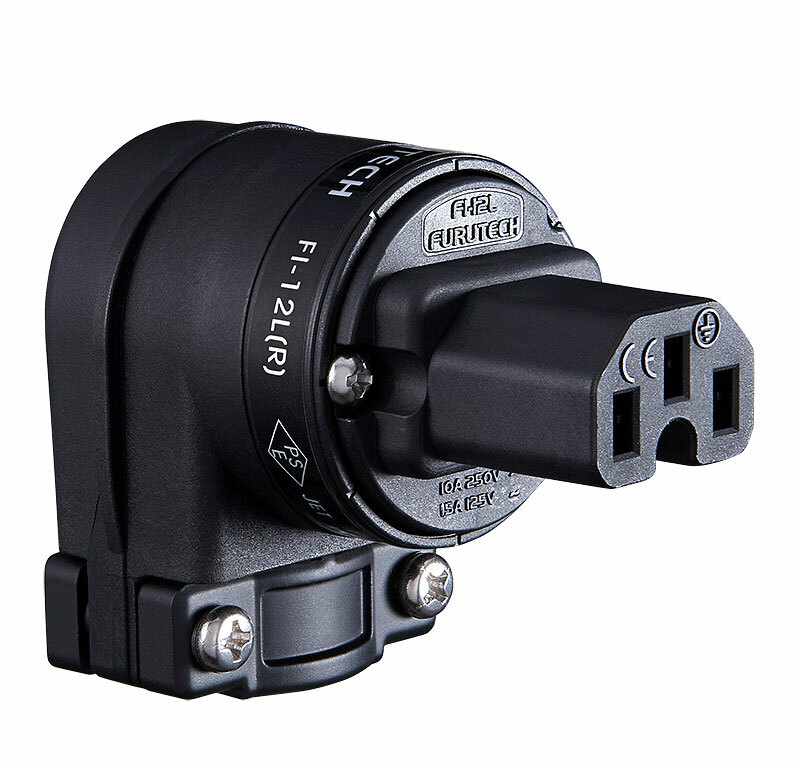 FI-03 (G) & FI-03 (R) - Furutech has just introduced the FI-03 15 AMP IEC inlets with an integrated 5X20mm fuse holder. Please note fuses are sold separately. This newly designed 15A IEC inlet means you can the cheapo stock inlets with something of subsantially higher quality. Dimensions: 44.0mm (W) x 28.6mm (D) x 33.0 (H) Rated up to 10A at 250V. 15A Oyaide Inlet R IEC Inlet - $74.99 ea. The Oyaide Inlet R is a highly anticpated product that is finally here! The Oyaide Power Inlet R is Oyaide's statement inlet, and is very simply composed of just a housing and blades. The housing is made with 30% glass filled PBT, for quality, durability, vibration absorption, and heat resistance. Due to the wider area where the cable is to be attached, it makes soldering work easier compared to a regular power inlet. The blade is trimmed down from phosphor bronze, and after hand polishing, is plated by platinum and palladium, determined to be the best sounding based on Oyaide's repeated tests with prototypes.